RIBBON CUTTING: Bolt and his parents do the honours; Inset, with headmaster Mark Nicely. 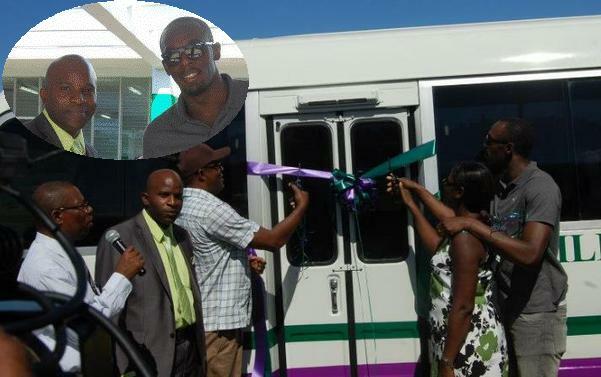 On Wednesday, the student body of the William Knibb Memorial High School in Trelawny received a wonderful early Christmas present, thanks in large part to their world-famous alum Usain Bolt, who donated a 29-seater Hino bus (valued at close to J$5 million) to the institution during a handing-over presentation, which was also attended by Bolt’s parents, Wellesley and Jennifer, manager Norman Peart, and longtime colleague Nugent Walker, among others. Meantime, Bolt’s Nissan Gold GT-R, which was recently put up for auction, sold for more than US$191,000, with all the proceeds set to benefit Jamaican kids through Bolt’s foundation.